Gold has been the choice of designers through the centuries in décor and jewellery. In tombs dated back AD400, archaeologist have found gold strips woven into fabric. 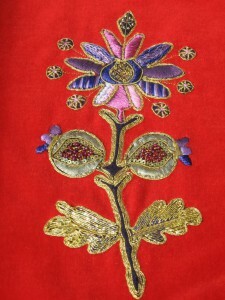 Many churches continue to embellish or embroider vestments and wall hangings with metallic threads. Goldwork (embroidery) uses fine strands of metallic thread, coiled wires, gold beads blended together to capture the eye and bring a richness to a designs that photos can not do justice to.